TASHKENT (UzTAG) — Saudi companies are considering creating a network of hotels in Bukhara, Samarkand and Khiva, the Uzbek State Committee for Tourism Development said. 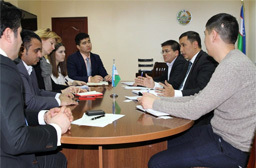 According to the Committee, this issue was discussed on 21 January at a meeting between U. Kasimhodzhaev, First Vice President of the State Committee for Tourism, and a delegation from JLL and Uzbekistan Ajlan & Bros Holding (Saudi Arabia), led by T. Weller, JLL’s Head of the Hotel Department for Russia and CIS, and A. Alhafaf, Director of Ajlan & Bros Holding for Corporate Communications. “During the meeting, representatives of JLL and Uzbekistan, Ajlan & Bros Holding, presented information on the activities and best practices of companies in tourism development and tourism infrastructure, as well as hotel construction. At present, companies have notably started to prepare a business plan for the implementation of a project to build 3, 4 and 5 star hotels in the cities of Bukhara, Samarkand and Khiva”, the message states. In turn, the State Committee for Tourism informed the guests of the concrete measures taken and documents aimed at increasing the flow of tourists in the country, both from neighbouring countries and from abroad. At the end of the meeting, business representatives stressed the importance of tourism in Uzbekistan for the development of the economy and infrastructure in the region and also expressed their willingness to implement a number of joint projects. It should be recalled that the Ajlan & Brothers group is known for the production of hats and finished fabrics for men. It manufactures most of its products in its own factories, which are then sold to wholesalers and retailers in Saudi Arabia, the United Arab Emirates, Bahrain, Qatar and Kuwait. Since 1979, the Ajlan & Brothers group has opened 45 branches and 200 stores in Saudi Arabia and the Arab States of the Persian Gulf. JLL is a financial and integrated professional real estate services company. It is one of the world’s largest companies with annual revenues of $6 blnand more than 280 offices in 80 countries and more than 60,000 employees. In Russia and the CIS, JLL is represented by offices in Moscow, St. Petersburg and Kiev.